Shades are a stylish window covering that fits in well with any décor style. 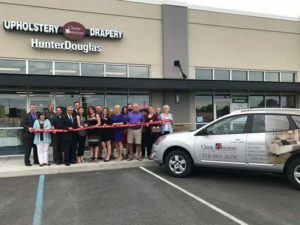 As your local Hunter Douglas dealer, Classic Interiors carries a wide variety of window shades. All of our window shades are custom-made to fit your windows, including specialty shapes. From classic honeycomb shades, woven wood shades, or traditional roller shades, our line of window shades offers the highest in quality. 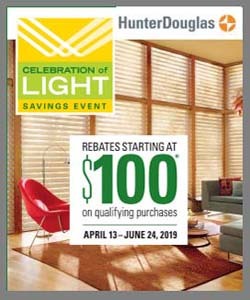 Plus, it’s backed by the Hunter Douglas Lifetime Guarantee. Shade fabrics range from man-made materials to natural, sustainable materials like reeds and bamboo. 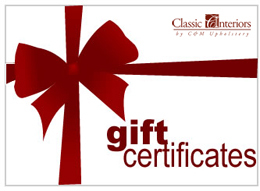 They are available in a wide selection of styles, textures, colors, and options. Shades also provide the ultimate in privacy, UV protection, and light control. Available in horizontal and vertical orientation, the Hunter Douglas honeycomb collection allows you to coordinate windows with sliding glass doors. Select from the largest collection of colors, textures and opacities. For ease of operation, honeycomb shades can also be ordered cordless or motorized for your safety and convenience. Duette® Architella® Honeycomb Shade – The premiere honeycomb shade features a state-of-the-art, patented, honeycomb-within-a-honeycomb design and the industry’s highest level of energy efficiency. Available in four different sizes – from 3/8” pleat to the industry’s only 1 ½” pleat. Duette® Honeycomb Shade – The original honeycomb shade is available in single and double-cell construction and comes in multiple cell sizes. This collection also offers the greatest number of new sophisticated fabrics and color selections and offers brand-new, sleek hardware. Applause® Honeycomb Shade – The value line of honeycomb shades offers a simplified selection of fabrics, colors and operating systems, keeping value in mind. These are the only honeycomb shades with triple-cell construction. Duette® and Applause® Honeycomb Shades with Vertiglide™ – Leave it to Hunter Douglas to turne their horizontal honeycomb material vertically and call it Vertiglide™! Now you can have the added insulation of a honeycomb shade on your patio and sliding doors. No cords, chains or wands required with left, right or center draw options. Today’s roller shades offer a unique look – from beautiful printed graphics to custom-printed patterns, you won’t find them with any other window coverings. 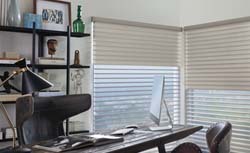 Designer Roller and Screen Shades – A new standard in design and performance, Hunter Douglas roller and screen shades offer sun-filtering, room-darkening and privacy control with a new custom clutch feature that offers the smallest light gap in the industry. This is a perfect shade for your patio or sunroom. In addition, it’s available in a variety of colors and opacities. Roman shades are a long-established fabric window covering that adds a soft look to any window. Roman shades provide a layer of insulation between the outside air and your home, improving energy efficiency without sacrificing beauty or style. Available in a range of fabrics, colors and light-filtering options, Roman shades come with either looped or flat folds, as well as more modern styles that offer a sleek and novel look. Vignette® Modern Roman Shades – Features a consistent fold and no exposed rear cords. The most energy-efficient version of the classic style, these shades trap air, creating an extra layer of insulation to keep your home comfortable. Available in different fold styles and sizes, and a horizontal or vertical orientation. Design Studio® Roman Shades – Design Studio® Roman Shades come in a wide selection of timeless fabrics like linen, cotton, and silk. Also, they come in four distinct styles. You can customize the shade by adding complementary valances, trims, and tapes. Add optional lining for additional privacy and energy-saving insulation. Solera® Soft Shades – Made of woven and non-woven fabrics that create a fluid, sculpted look. Available in both light-filtering and room-darkening options, Solera® Soft Shades are the only soft shades with cellular construction. The large soft cells gives the appearance of a Roman Shade, but without separation. Provenance® Woven Wood Shades – Natural refinement that adds warmth and texture to any room in your home. Made from renewable materials such as reeds, grasses, and bamboo, woven wood shades are striking and environmentally friendly. In addition, room-darkening, top-down/bottom-up, and motorization options are available. For patio or sliding doors, choose Provenance Woven Woods Vertical Draperies. Contact us today to meet with a design consultant or to learn more about the Hunter Douglas Shades Collection.